Recently I entered Trader Joe’s Quintessential Quinoa Recipe Competition. The rules were simple: (1) the recipe must feature no more than 7 Trader Joe’s ingredients (one must be quinoa) and (2) prep to should be no more than 20 minutes (not including cooking time). 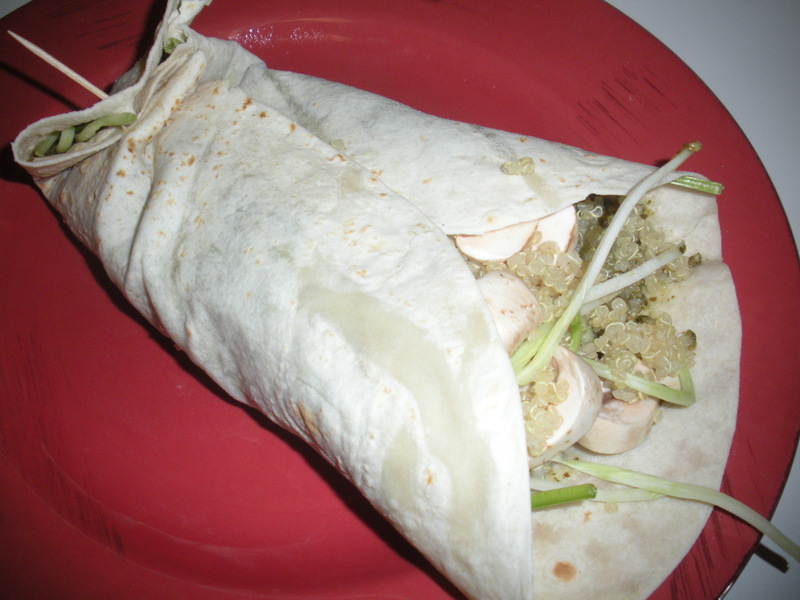 For my entry, I came up with this recipe for a Pesto-Quinoa-Veggie Wrap. Since my husband and I have vastly difficult tastebuds, I am often cooking for one, and this sandwich makes for a quick lunch. 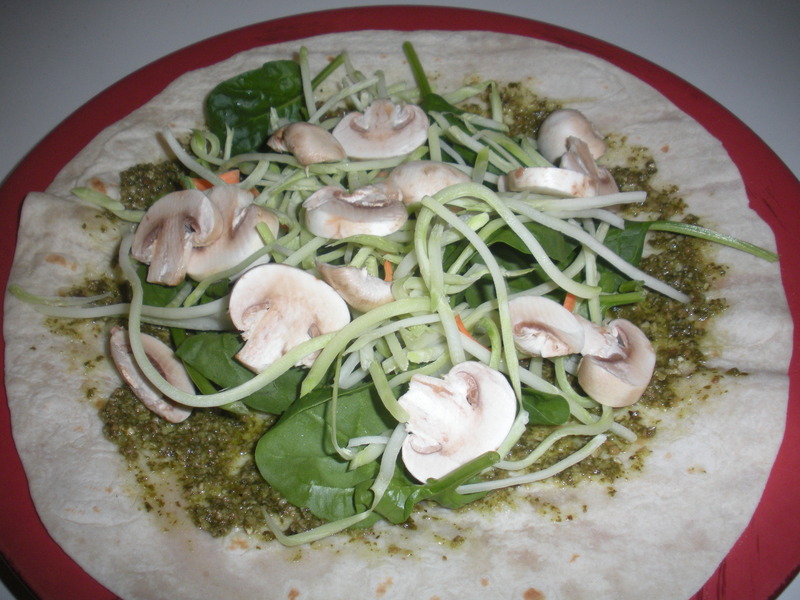 I loved the raw combination of veggies so much that I ate this wrap for lunch every day for a week. Alas, I was not selected a one of the 5 finalists in the competition (they received over 500 entries), so I am posting the recipe here for you to enjoy. 1. In a small saucepan, combine quinoa and water. Bring to a boil. Reduce heat to low, and simmer for 10-15 minutes, until all of the water is absorbed. Remove from heat and set aside. 2. Microwave tortilla on high for 30 seconds to warm. 3. Spread pesto on tortilla. 4. Add a layer each of spinach, broccoli slaw and mushrooms. 5. Top with quinoa and fold into a wrap. Enjoy! 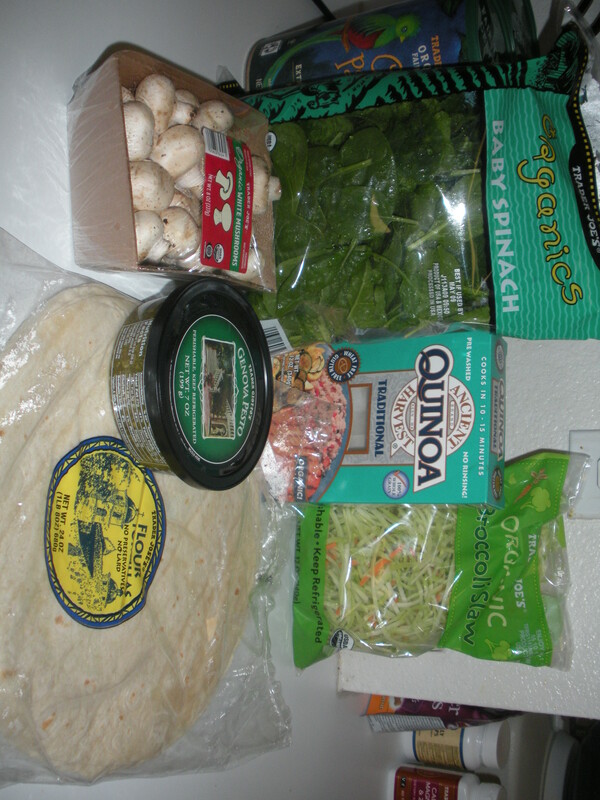 This entry was posted in Healthy Living, Recipes, The Simple Living Experiment and tagged lunch, quinoa, recipes, sandwiches, Trader Joe's, vegetarian recipes. Bookmark the permalink.